Sunday April 28th 1895 It looked a little like rain and we did not go to church. Will looked for Will Hedges to see about the well but he did not come. After an early dinner we went over the river. The folks were all at Otts and we stopped there. Will was over to Woolfs awhile. We did our evening work after coming home and read awhile. Monday April 29th 1895 Will helped me some with the washing before Will Hedges got out. I finished it and done a lot of other work today in churning baking cake making pressed chicken etc. I went down to the well late in the afternoon. They got it done about six oclock. I have chickens hatching. Tuesday April 30th 1895 I baked bread this forenoon and looked after my chickens some. I helped Will plant some garden. I ironed in the afternoon it was very hot. It rained a very little about four oclock. I did some mending in the evening. 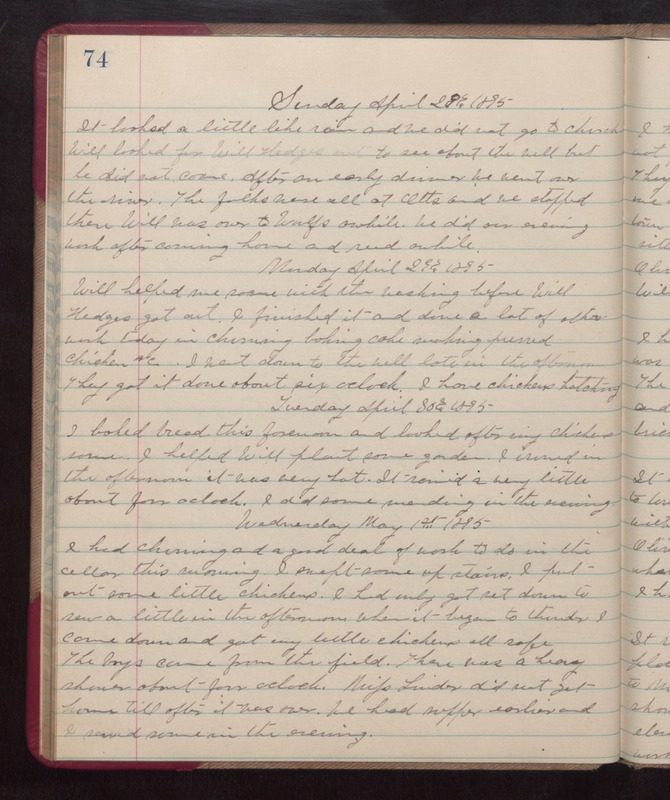 Wednesday May 1st 1895 I had churning and a good deal of work to do in the cellar this morning. I swept some up stairs. I put out some little chickens. I had only got set down to sew a little in the afternoon when it began to thunder. I come down and got my little chickens all safe. The boys came from the field. There was a heavy shower about four oclock. Miss Linder did not get home till after it was over. We had supper earlier and I sewed some in the evening.